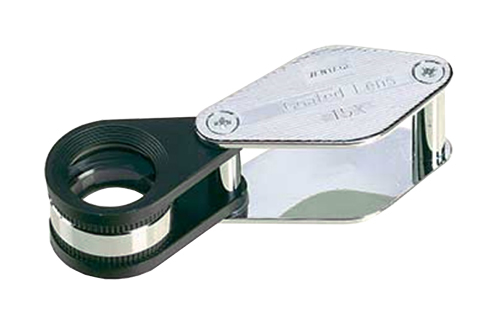 MA-LRX-200 This lightweight, easy-to-use magnifier has a big 2" x 4" lens that’s both shatterproof and distortion-free. Its rectangular design provides a wide viewing area for reading blocks of print, maps, etc. 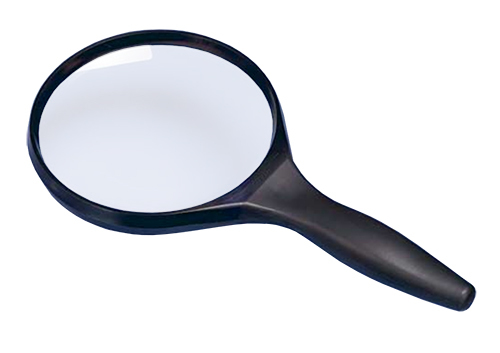 Features a reversible reflector that permits magnifier to be used left or right-handed. Comes with two “AA” batteries. 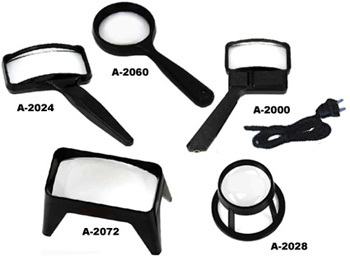 MA-100 Ideal magnifier for pocket, purse, desk or glove compartment. 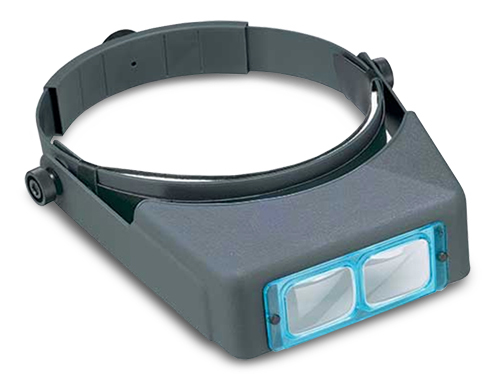 The battery operated light beam illuminates the magnified area to provide perfect viewing. Strong, 4X, 1 1/4" square lightweight acrylic lens. Packed complete with replaceable AAA batteries and type 222 bulb. Model MA-150A Same as above except with larger 1-3/4" square lens and 3X magnification. 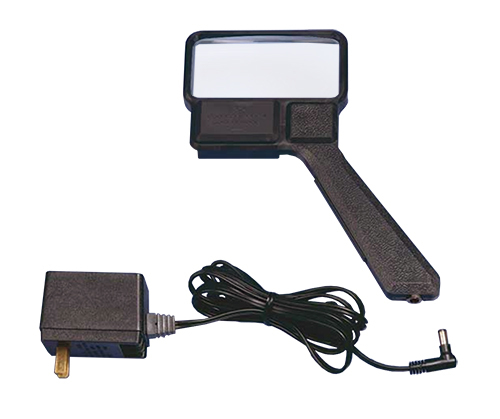 Model MA-200 Magna-Lite, larger version of the battery operated illuminating magnifier. Optical quality acrylic 2X lens, 3 1/4" diameter. Packed complete with 4 replaceable AA batteries and GE PR17 bulb. Model MA-300 Magna-Lite Pocket Magnifier with 10X Lens, Incandescent type bulb, 2 AA batteries. Lens dimensions :1-1/4" x 1-1/4". Overall dimensions: 4-3/4" x 1-1/2"
MA-C-602 2-1/2" Lens, 7 diopter, 6"
MA-C-603 3-1/4" Lens, 5 diopter, 8"
MA-C-604 4" Lens, 4.5 diopter, 9"
MA-C-610 2” x 4”, 4.5 diopter acrylic lens is produced to high ophthalmic standards. Bright 6 watt bulb and brilliant reflector cover adapts for both right and left hand use. Natural hold switch activates light when in use and allows for automatic shut-off of light when not in use. Detachable cord with strain relief easily unplugs for use with or without light. Additional bulbs and power supplies can be ordered separately for convenient replacement. 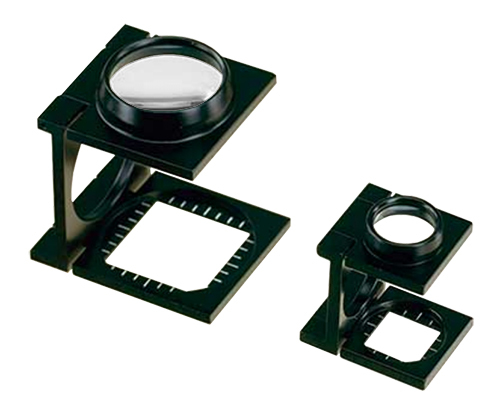 These loupes provide magnification for visual accuracy in miniature assembly, machining and inspection. Easily attached to either temple of all eyeglass frames. Completely adjustable to individual use. Available in a range of powers extending from 3X to 9X. These magnifiers consist of models that have both single and double lens systems offering extreme versatility. The lenses in the double lens magnifiers can be used alone or in combination to produce the desired magnification. The swing away case is designed to be used as a handle when the magnifier is in use and a protective case when not in use. MA-V-341-T Triple Folding Pocket Magnifier, Same as above but with 5X, 10X and 15X. A unique design, compact in size, that is convenient to carry in pocket or purse. 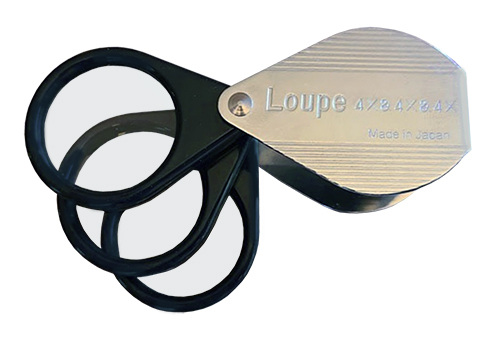 The durable plastic case slides open for use as a handle and snaps shut to protect the magnifier when not in use. Three different powers are available to provide the right magnification for the right job. Magnifiers are color coded by Magnification. MA-P-703 3X Magnification. Light Grey. MA-P-704 4X Magnification. Medium Grey. 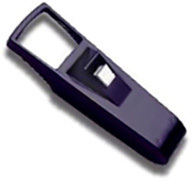 MA-V-697 Bar Reader Fits comfortably in pocket or purse. Lays directly on printed page. 5-1/2" x 1" plastic lens with vinyl carrying case. 5X cyl. lens. 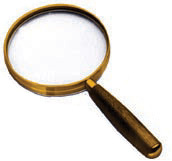 Aspheric magnifiers unlike spherical magnifiers provide an “orthoscopic” image. Our aspheric lenses are shaped with a variant radii calculated to produce a sharp image right to the edge of the lens. This allows for distortion-free viewing over the entire lens area with greater magnification than is possible with a normal spherical lens. Strong 2x4 aspheric lens gives 3X magnification. Powerful 6 Watt 110V bulb combined with bright reflector gives maximum lighting over viewing area. Natural hold switch activates light when in use and allows for automatic shut-off of light when not in use. Detachable cord with strain relief easily unplugs from handle when light is not necessary. Additional bulbs and cords can be ordered separately for convenient replacement. 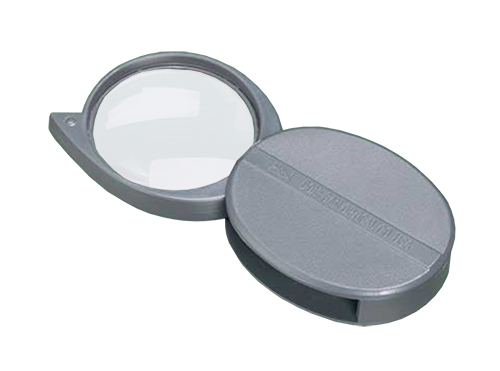 Magnifier utilizes the same 3X aspheric rectangular lens as in the 2 x 4 illuminated magnifier but without the light. Sleek lightweight designer handle allows for hours of comfortable use. Powerful 5X aspheric lens mounted in a prefocused stand allows users to view large 60mm area. Great for any activity requiring distortion free viewing at higher magnifications. Same powerful 5X aspheric lens as used in the A-2028 magnifier, conveniently mounted in a hand held reader. Compact design easily fits into pocket or purse. A preferred instrument is a highly versatile precision-made binocular magnifier that is worn on the head leaving both hands free, and can be instantly tilted downward when needed and upward when not in use. OptiVISOR can be worn over regular or prescription glasses. 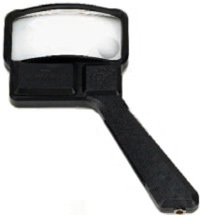 MA-V-388-1 Linen Tester Double lenses mounted in black enameled brass frame, folds flat. Used in graphic arts, engraving and industrial inspection. 1" Lenses, 5X Magnification. MA-V-388-3/4 Linen Tester Same as above but with 3/4" Lenses, 6X Magnification. 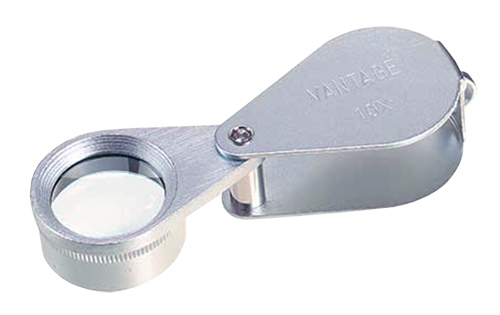 MA-V-388-1/2 Linen Tester Same as above but with 1/2" Lenses, 8X Magnification. MA-V-400 Double Coddington has one 15X (15mm) and one 20X (10mm) swing out double lens systems in chrome plated brass case. Vinyl carrying case. MA-V-309-15 Coddington Magnifier Double lenses mounted in chrome plated case, 15mm lens, 10X Magnification. MA-V-309-23 Coddington Magnifier Same as above but with 23mm lenses, 10X Magnification. 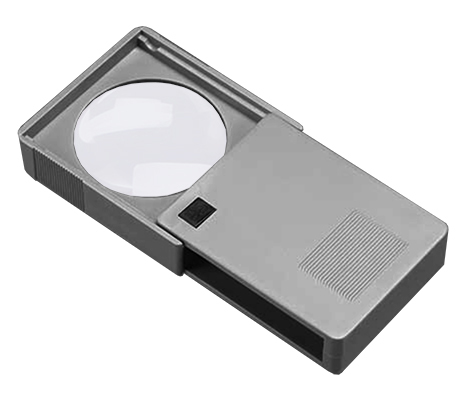 MA-V-394-15X Achromatic Magnifier, Coated lens systems voids color aberrations. 15mm lens mounted in beautifully finished chrome plated brass case. Comes with vinyl carrying case. MA-V-394-20X Achromatic Magnifier Same as above except offers the higher magnification.